focuses on creating distinctly unique pieces of furniture using locally reclaimed materials and wood. ​Red Oak Wood Shops mission is to incorporate reclaimed materials in a creative way resulting in functional works of art. 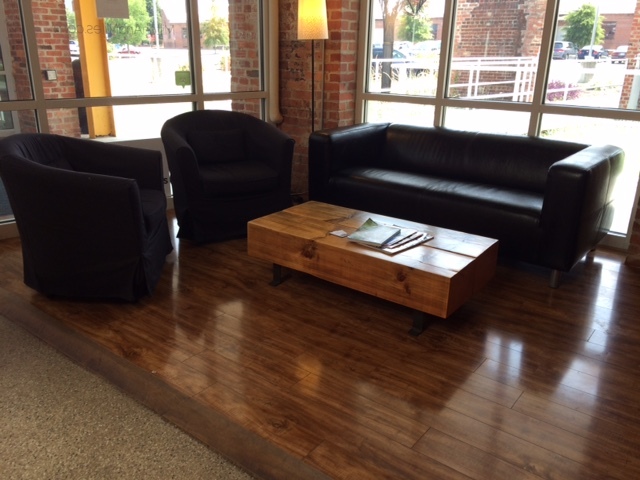 The results are distinctive furniture that transforms your living space and inspires conversation. Our newest creation: three beam on iron legs. Please contact if interested in price or a showing. This magnificent piece features three old beams from a barn in Nash County on sturdy metal legs. Is it a table or a bench? Yes to both. This remarkable beam is from a Long Leaf Pine. The true heart pine that helped build America's factories. This beam was in a warehouse that was built in mid 1800's. The pine tree was over 250 years before it was cut, making this piece of wood close to 500 years old. It is beautiful with the visible circular marks of a large circle saw blade. This wood has the deep reds and blondes inherent in heart pine. This special piece can serve as a side table, a bench and also wonderful conversation. It is movable with 1800's cast iron wheels underneath. Blue Moon Gallery, Wilmington, NC. Two very large heart pine beams on castors creates not only a conversation piece but a great small table, stool, or stand. The longleaf pine shows clearly with the blonde to red hues in this piece. The desired circular saw marks clearly visible and the vintage hand forged hinges on top sets this table apart. This is truly one of a kind. ​Cabell Fine Art Gallery, Lexington, VA. These are old beams reclaimed from an early 19th century home near Vanceboro, NC. Old pine with early saw marks, either pit-sawed or hand sawed. The beautiful grain and growth rings grab your attention on the incredible eye catching table. Salvaged 14' iron screws hold these beams. Bel Air Art Center, Rocky Mount, NC. This versatile piece offers a work space along with plenty of storage. Old industrial legs support golden oak boards. Incredibly beautiful pine beam sits on retro, hair-pin legs. Great as a side focal piece or footstool, or anything you dream! This old pine actually glows on this utilitarian side piece. Old iron base provides display and storage. This amazing piece was originally a turn-of-the-century wardrobe. The base of that piece is now reclaimed and topped with old pine floor boards to make a stunning coffee table with ample storage in the working drawers. This matching set of pine on sturdy metal tables would be additions to any sitting areas. This creation is truly unique! The metal base retains its original red/green paint, while the top and shelf are chunky, old heart pine. Perfect for a small space with a ton of flair. Beautiful old pine boards top this hand-made metal base. This lovely table is fashioned from reclaimed poplar beams floating on an airy, custom designed metal base. 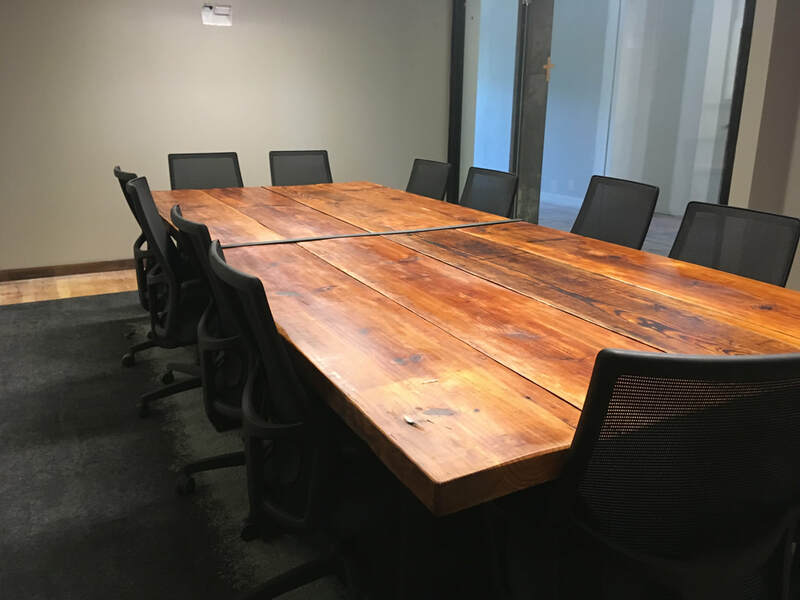 These magnificent conference tables were created with hand crafted bases and original heart pine flooring from 1800's. Created from a Pennsylvania farm beam, the wood is over 200 years old and features ax and adze marks on the surface with an unusual cut away. 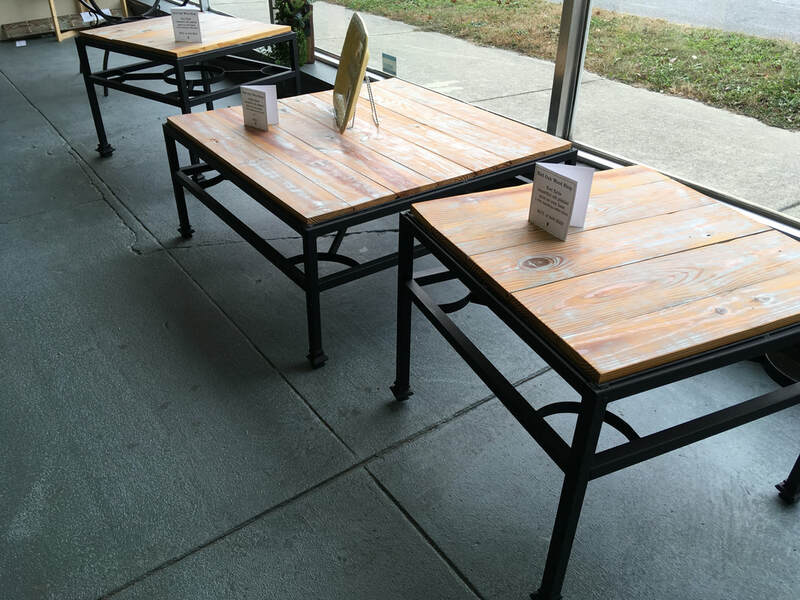 ​This table measures almost six feet and is supported on vintage mortar jacks. A piece of 1/2 " glass covers the top. 1800 reclaimed groove & groove pine boards from a factory floor makes a beautiful coffee table that can be adjusted to a desk height. The base are the legs of an old school desk easily moved to desired height. The half circle table has vintage barn pine on a reclaimed metal base. This work station is created with old pine taken from a barn in Wilson County. NC. on a vintage industrial base. This very unique retro base from the 50's has curly pine boards on top. It is a rare pine, with one in a hundred pine trees having this type of grain pattern. ​Small Side Table on Vintage Bamboo Metal Base. ​This small table can hold your pink lemonade or a nice book. The vintage base looks like bamboo ,with each leg comprised of three metal rods belted together. The wood top is salvaged pine. These one of a kind side tables are created from Atlantic White Cedar rescued from a boat builders barn circa 1940. ​The bases are the rear axle from a Model A Ford . "L " beams. This wood is the longleaf pine that was decimated by 1920's, there is ax and adze marks visible and you can see the close growth rings. Reclaimed American Tulip Poplar from a log cabin becomes a great rolling coffee table. 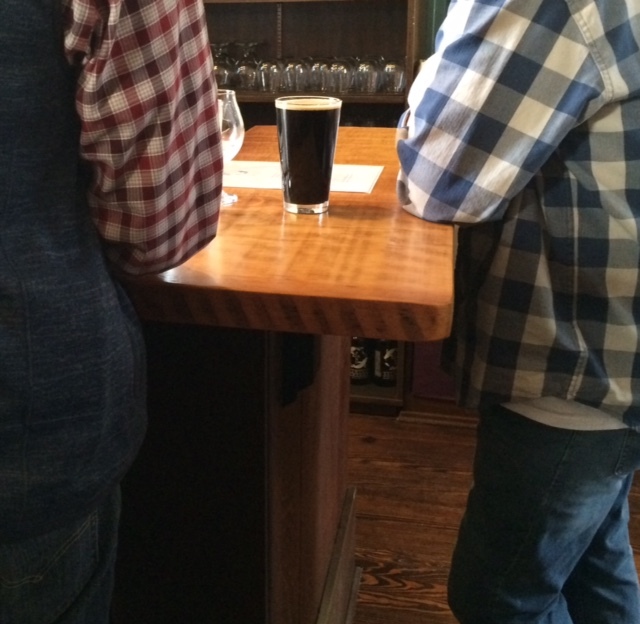 The wood has great color with beautiful grain and checks. The wheels are vintage pulleys that make moving this beam table easy. located in the new Station Square Records, in downtown Rocky Mount,NC. 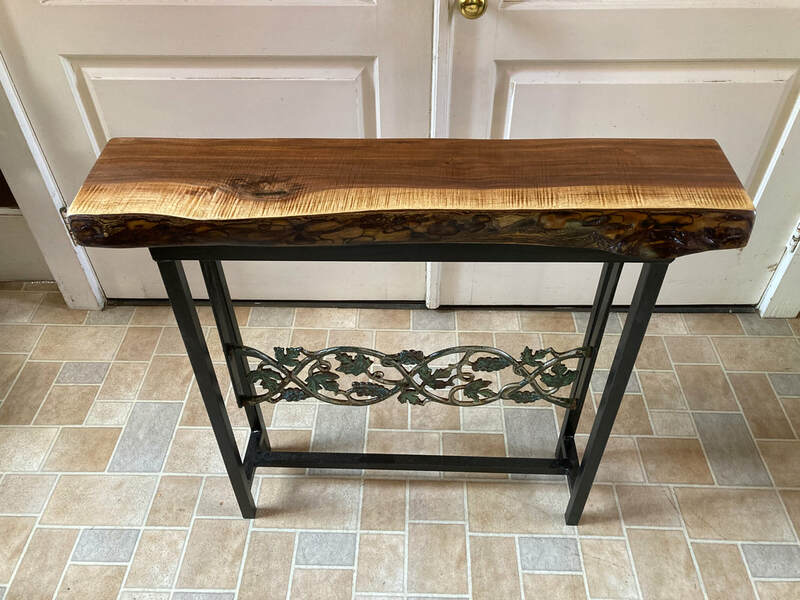 This piece is created with one beautiful piece of 15' wide pine, supported by vintage handcrafted andirons that have been re-purposed to become unique legs for this table. Seven Sisters Gallery, Black Mountain, NC. This table has intricate handcrafted metal work, it is real American iron. The top is old pine wood from a 1920's factory ceiling. The pine has beautiful color and grain inherent to this old wood. A coffee table and two matching side tables make a beautiful trio. The wood is old pickled pine from walls from a 1920's store in Eastern NC. on unique metal bases. This cast iron base is adjustable in height. This piece could function as a hall table or an end table. The top surface is old maple butcher block style. This table is created from early 1900's old heart pine supported by a beautiful iron base with circles held in suspension. Imagine a beautiful lamp or plant on top. 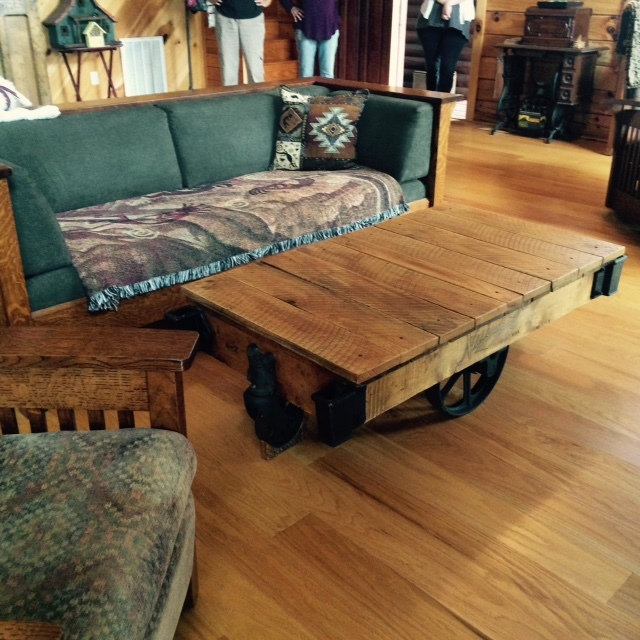 Turn of century railroad cart transforms into a great conversation piece. 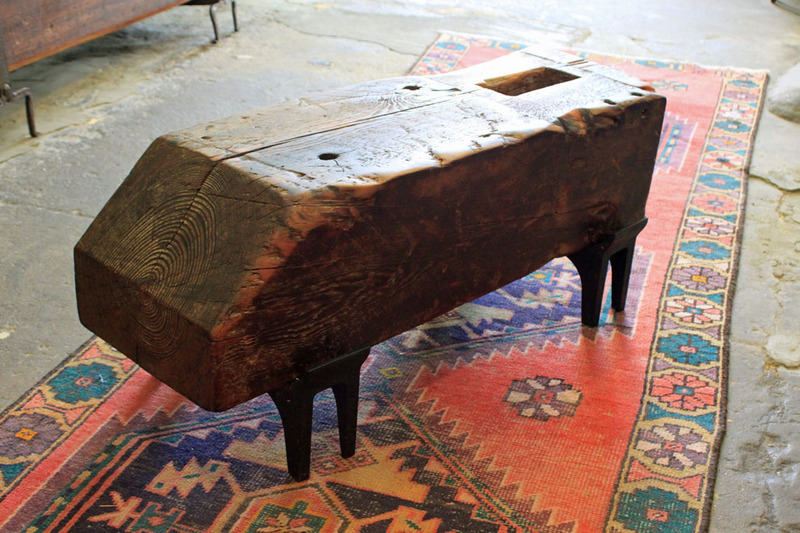 This coffee table, forged from American steel and rare wood can be moved easily. The Atlantic White Cedar top was discovered in a boat builder's barn in Eastern NC. The barn was about to be demolished when the hidden treasures were found. The Atlantic White Cedar forest was cut to near extinction, there are efforts from New Jersey to Florida to re-seed this magnificent tree.You will not see this size Atlantic White Cedar growing today except in protected areas. 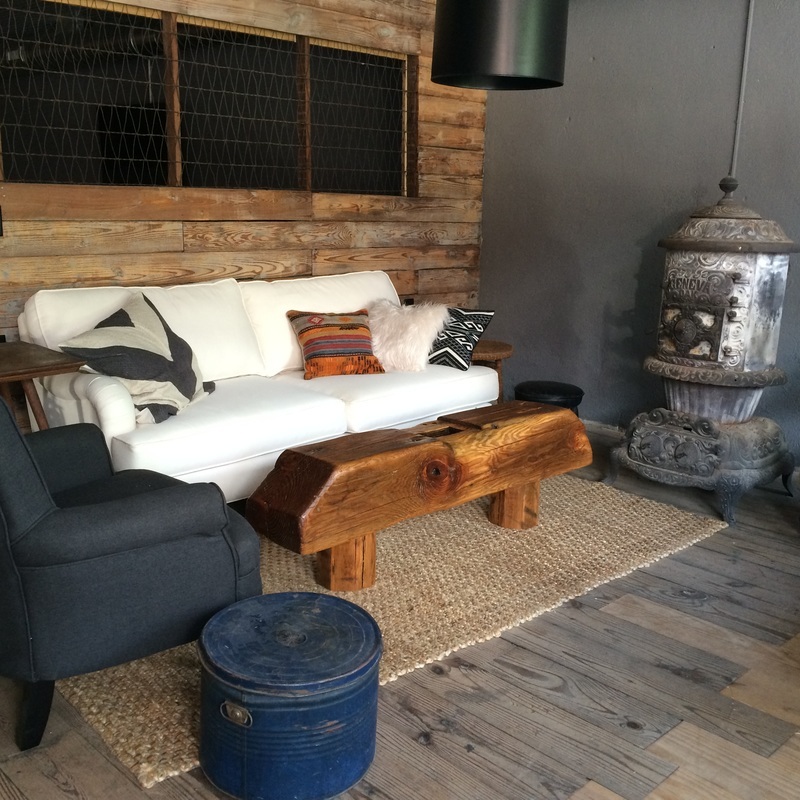 "The vintage iron base and the old barn wood is the perfect piece in our hall, couldn't be more pleased. " MBT Fairfax, VA.
"I am so pleased with the table lights and the hat rack." WE love the mantel in our new home! Thank you for letting us look at your wood , and a special thanks for finishing the mantel , ready for installation. "This is the right table I have been looking for." "Beautiful work Red Oak Wood Shop !! We are looking forward to your visit as well, please keep in touch and thanks for sharing.
" We Love this table!" "The tables look like they belong and have always been here." 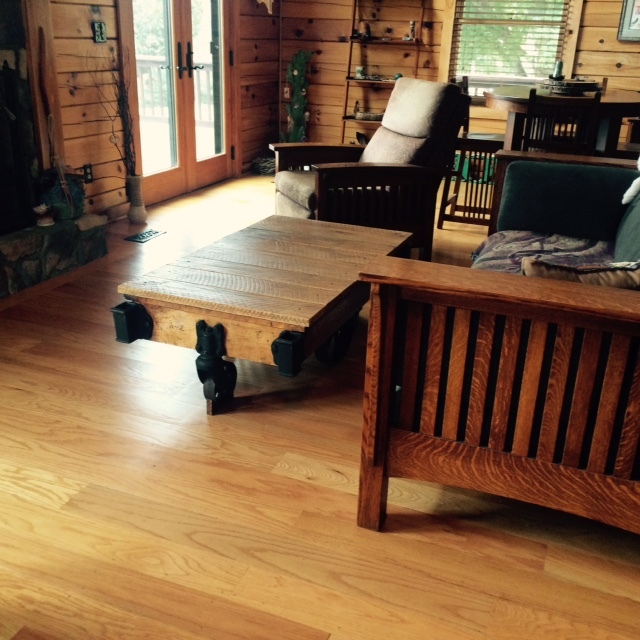 " Red Oak Wood Shop matched beautiful old wood with a family heirloom that our family will treasure forever." old pine with the tenon still on it , wow. We feel lucky to have this piece." 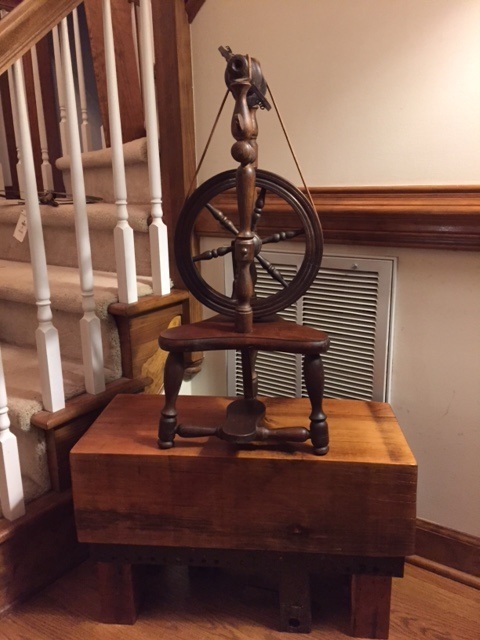 Perfect for displaying my antique spinning wheel. Home in Chapel Hill, NC. The Hen & The Hog Restaurant in Halifax NC. 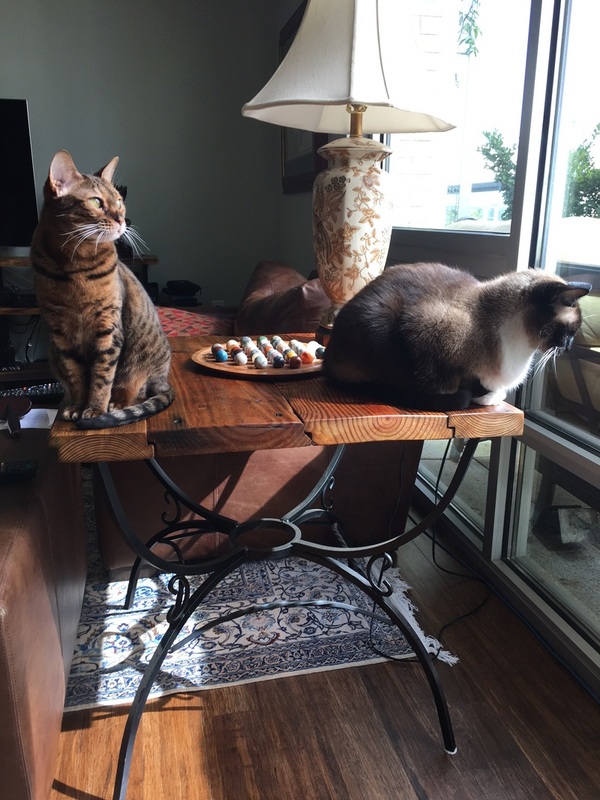 "The table fit in our home perfectly." 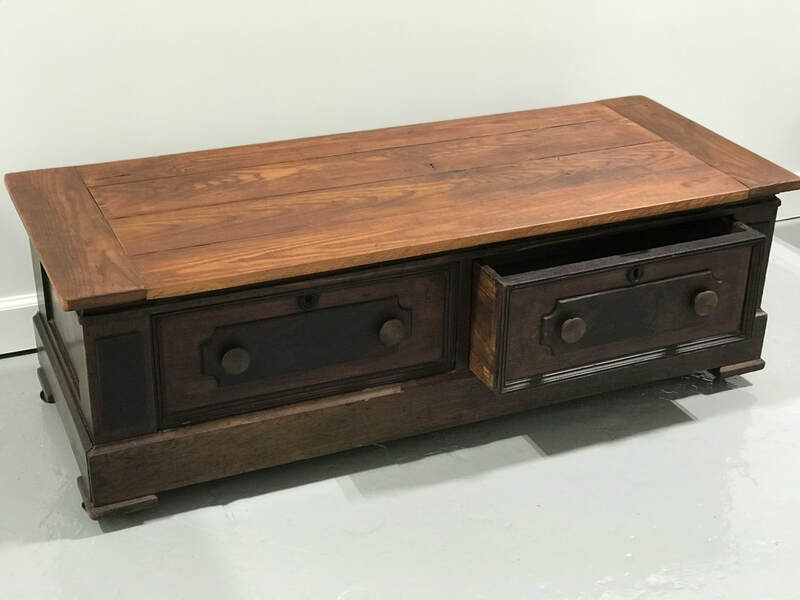 "After looking for weeks for a coffee table for my daughter, we stumbled into the Bel Air Artisans center and found the perfect piece! 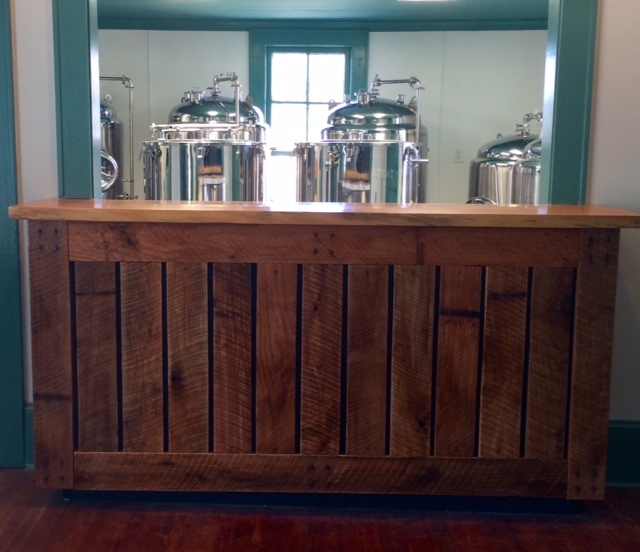 Red Oak Wood Shop crafts wonderful pieces from reclaimed wood and beams from the area. Each piece is unique with its own story. " from Buck County, Pennsylvania. 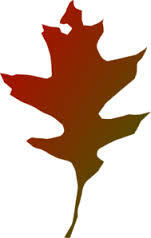 Red Oak Wood Shop works hard to insure our products are safe and well crafted. 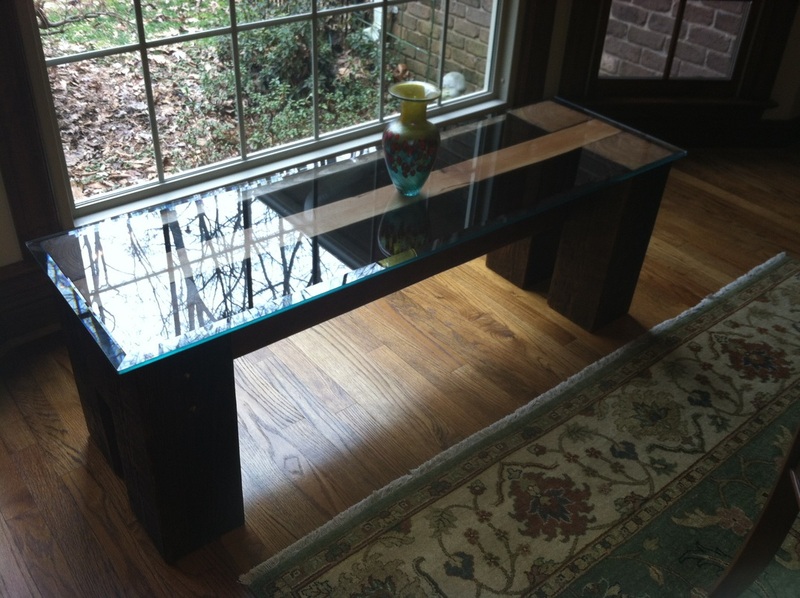 We use the highest quality materials, including reclaimed salvaged wood, iron and glass. These are natural materials and can contain inherent characteristics including but not limited to checking, chipping, splintering, nail holes, and variances in color, etc. Our products are engineered to be durable and long lasting. Each piece is designed to become an heirloom that your family can enjoy for years. In no event we will be liable or responsible to personal injury or damage done to personal property from the purchase of this item. We love what we create and believe in the recycling and re-purposing business. We appreciate your interest and business. The Nature Conservancy in the preservation of our lands and the re-seeding the endangered species of various trees.